I am new to monkey grass. Can I kill all the unwanted stuff with weed killer and keep my monkey grass safe, or do I have to actually weed it all? Your best bet would be to hand pull as much as you can to keep weed growth to a minimum. However, you could also try sprinkling corn meal in the area, which has a chemical in it that acts as a pre-emergent on plant seeds preventing them from germinating. Sprinkling corn meal will not harm plants but will keep weeds from growing. Another option (though not one I enjoy recommending) is the use of conventional weed killers. 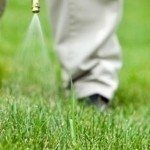 Most weed killers will dissipate after a certain period and that period will be noted on the packaging. Ortho Grass-B-Gon will kill weeds but won't harm your monkey grass.